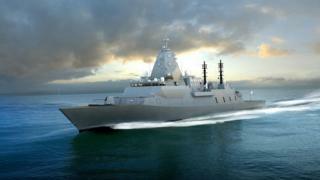 The ships will be based on anti-submarine frigates that BAE is building for the UK's Royal Navy. "We are proud to have been selected as preferred tenderer to provide the Royal Australian Navy with a world-class ship, equipped with the latest technologies and designed specifically to meet its needs," BAE Systems Australia chief executive, Gabby Costigan said. UK Prime Minister Theresa May said the deal was also an "enormous boost" for the UK economy and reflected the government's strategy to "build on our close relationships with allies like Australia" as the UK prepares to leave the EU. The ships to be built will be based on BAE Systems' Type 26 frigate, and will be called the "Hunter class". "The Hunter class will provide the Australian Defence Force with the highest levels of lethality and deterrence our major surface combatants need in periods of global uncertainty," the Australian government said. The ships will be fitted with long-range anti-missile defence systems. While the overall budget is £19.6bn, only a part of that will come to BAE Systems for the design and build of the frigates. BAE Systems chief executive Charles Woodburn said: "I am proud that our world class anti-submarine warfare design and our approach to transferring technology and skills to the nations in which we work is expected to contribute to the development of an enduring world-class naval shipbuilding industry in Australia." Italy's Fincantieri SpA and Spain's Navantia also bid for the contract. BAE's shipyards on the Clyde in Glasgow are unlikely to see a significant boost to jobs. Nevertheless, defence analysts said the deal represented a significant success for British naval exports. "It is the deal of the century," said Francis Tusa, editor of industry newsletter Defence Analysis. The UK has had an "abysmal" export record for warship sales for the past five decades, he said. But this represented "a massive sea-change". Canada, which is also planning to order warships later this year, might be influenced by Australia's decision, he added. Selling the design overseas will help spread the costs of design and production of many elements of the frigate, potentially bringing down the cost of the Type 26 to the Royal Navy significantly, according to Mr Tusa. However, it was not only BAE Systems who would benefit from the deal, he said. Small and medium-sized UK companies would be likely to win orders for some of the technology required on the Australian ships. Firms that are already supplying the UK government's order of the Type 26 would be in a strong position to also supply Australian orders. The design success of the Global Combat Ship, otherwise known as the Type 26, is a breakthrough for BAE Systems. Over several decades, it has struggled to turn the Royal Navy's requirements into a design that other countries want to buy, or are willing to pay for. Orders from other navies used to mean manufacturing at UK yards. But now, other countries want to get the economic benefit of their military spending, so they insist on building themselves. The hull can be the relatively cheap bit of building a complex warship, so there may be benefits to British arms exporters in selling weapons systems that fit into the Australian frigates. However, this looks like a design which was heavily subsidised by the UK taxpayer, being sold overseas, and wholly to the benefit of BAE Systems. It appears that the UK taxpayer sees none of the direct payback or royalties from that investment. Independent defence analyst Paul Beaver said the appeal of the Type 26 design is that it is modular. "We are supplying the technology behind the hull, other nations will put their engines, their weapons systems into it. It's designed in a way that it can cope with that. "You don't have to buy a certain type of missile or gun. You can buy a raft of different ones which will be very attractive." He said he believed the agreement would turn out to be part of a wider deal on defence procurement between the UK and Australia.